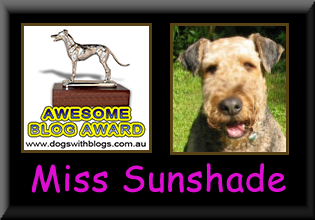 Life of Miss Sunshade - The Vancouver SuperDALE: Second painting of ME! This is the second painting of me done by Barbara Keigher. 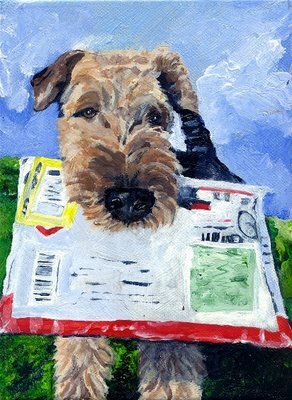 The painting is being listed on e-Bay, and 15 % of the auction goes to Airedale Terrier Rescue & Adoption (ATRA). 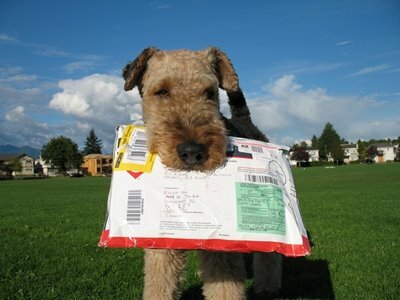 I was so excited to get my parcel from Butchy & Snickers that I decided to play "keep away" game with mum!! Inside that parcel was my beautiful HOT PINK fleece jumper suit! All fingers and paws are cross here in CT that you guys win this masterpiece! Picasso is surely rolling over in his grave....he missed an opportunity to paint a beautiful subject like yourself! That is a lovely painting! I can't wait to see your new Pink fleece jumper suit! I think she just needs to paint thousands of pictures of you and drive your Mommy broke! That is such a beautiful painting of such a beautiful YOU! I bet she enjoyed every minute painting your lovely portrait! Your fleece jumper suit is sooooo adorable and you look so wonderful in it. I loved all the views especially the "down" view! P.S. I forgot to tell you that, yes, Momma did all the programming on my site and made all the stuff herself. sunshade, to enable your mom have better chance of getting your painting, i suggest next time you post the entry ONLY 1 DAY BEFORE THE BID CLOSE! but, did your mom bidding for this one? btw, any other painting of you on the way? Wow, Sunshade! That picture is so nice!!! So, your mummy going to bid for it again? WOW! Gorgeous as always, but how could it not be? It's a painting of my dreamgirl! By the way, my mom said that if you're bidding on something on ebay, the best way to do it is to use something called auctionsniper.com - it's very inexpensive and places a maximum bid for you at the last few seconds of an auction (so you don't have to wait up for it). You can still be outbid if someone bids higher, but it's a good way to win auctions at the last minute. Barbara captures your expression so beautifully. You are truly a work of art! Maxey: thank you my dear!! Sue: I'll remember to remind mum to bid and bid! Chelsea: that is so sweet of you to say, I'm sure he would have loved to paint any of the blogging kids because you guys are so cute and so different too!! Teddy: Thanks, I think it's a great painting too! You can see my pink fleece jumper suit if you click on the link on the page! Zach: I think that's a great idea, how about Monaire Lisa or Mona Lisadale? I do however think that I tend to smile a little "wider" than Mona Lisa..hehe! Hey little Roo: I hope Barbara enjoys painting me, because she can sure capture my essence. I'm glad you liked my pink jumper suit, because I LOVE IT!! Boo: thanks for the reminder, I do hope mum doent' make the same mistake she made last time if she does decided to bid. I think Barbara is gonna be painting quite a few pictures of me, I just dont know which ones yet. Jay: it sure is cute, and I know mum is thinking about bidding. She hasn't made up her mind completely yet. Oh Bogie: thanks for your sweet compliment, and a BIG thank you to your mom on her little tip!! T-man: You said it all. Barbara seems to be able to capture that "Sunshade look" and transfer it onto the canvas. Mum took one look at that painting, and saw my famous "come catch me" gaze!! Fufu: I know the picture of me and Mousie is just darling, but the quality is really bad because it is a scanned photo. Also Barbara paints from whatever picture she wants to, so I dont' really have a say unless it's for commission (which mum is thinking of doing for one picture). Marvin: Thank you! I have left a msg on your blog, hopefully it will help you in joining DWB, and the X-mas Card exchange!! Another lovely picture!!! She is really talented. Of course she has the bestest model, hehehe! She needs to do a painting of you in your pink jumper! Tell your Mama to not bid until the last couple minutes of the auction and to plug in the highest bid she will go to. Im also from Vancouver B.C.